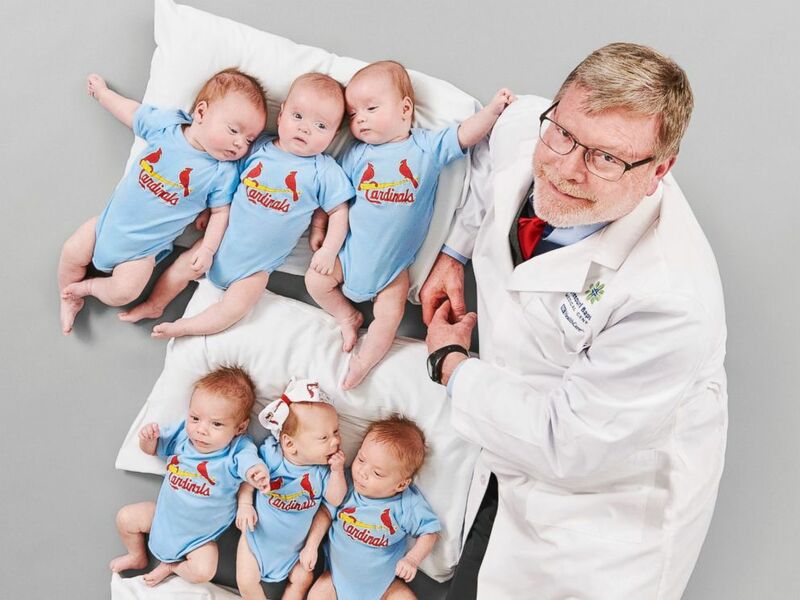 A doctor in St. Louis delivered three sets of triplets within six weeks of each other—something his medical center is referring to as their resident "baseball team." Dr. Michael Paul of Missouri Baptist Medical Center said delivering that many triplets so close together is certainly a rarity. Not only did Paul successfully deliver all nine children, he also helped the children’s mothers connect during their pregnancies. Jessica Kennedy, Kristen McCloy and Jeri Wright bonded over their special pregnancies after meeting each other through Paul. “It was so nice to have someone to speak to, to know what they’re going through and to make sure your worries and concerns were not the end of the world,” Kennedy, who gave birth to Reed, Knox and Finn on November 11, told ABC News. McCloy, who gave birth to Lucas, Emalyn and Colton on November 26, agreed, adding that the nurses at Missouri Baptist Medical Center encouraged the three mothers to find support in each other. McCloy and Wright were neighbors in the hospital while still pregnant, and Kennedy, who had previously met Wright, would come visit the two mothers even following the births of her children. Wright, who was the last to give birth on December 16, said the emotional support the mothers offered each other was incredibly important in their journeys. Paul said the camaraderie between the mothers has been beneficial to their experiences. “It becomes a club,” he said. The three mothers said they have remained friends and stayed in touch with Paul. The nine babies were even part of a baseball-themed photo shoot, which has been posted to the hospital's website. The shoot was inspired by the city's obsession with baseball and the fact that nine players take the field at a time. “We talked periodically over the course of the pregnancies…about how it was a unique experience and we needed to do something to highlight it,” Paul said. All of the mothers thanked Paul for making their journey smoother both in and out of the delivery room.